WHEELS: 17" X 7.0" ALUMINUM, TRANSMISSION: 9-SPEED 948TE AUTOMATIC -inc: Vinyl Shift Knob, TIRES: 215/60R17 BSW AS TOURING, QUICK ORDER PACKAGE 27J -inc: Engine: 2.4L I4 MultiAir, Transmission: 9-Speed 948TE Automatic, POPULAR EQUIPMENT GROUP -inc: 115V Auxiliary Power Outlet, 40/20/40 Rear Seat w/Trunk Pass-Thru, Power 8-Way Driver Manual 4-Way Passenger Seats, Rear View Auto Dim Mirror, Power 4-Way Driver Lumbar Adjust, OMAHA ORANGE, ENGINE: 2.4L I4 MULTIAIR -inc: 3.734 Final Drive Ratio, Wheels: 17" x 7.0" Aluminum, Engine Oil Cooler, Flex Fuel Vehicle, Tires: 215/60R17 BSW AS Touring, Zero Evaporate Emissions Control System, BLACK, PREMIUM CLOTH BUCKET SEATS, 3.734 FINAL DRIVE RATIO, Wheels: 16" x 6.5" Aluminum. 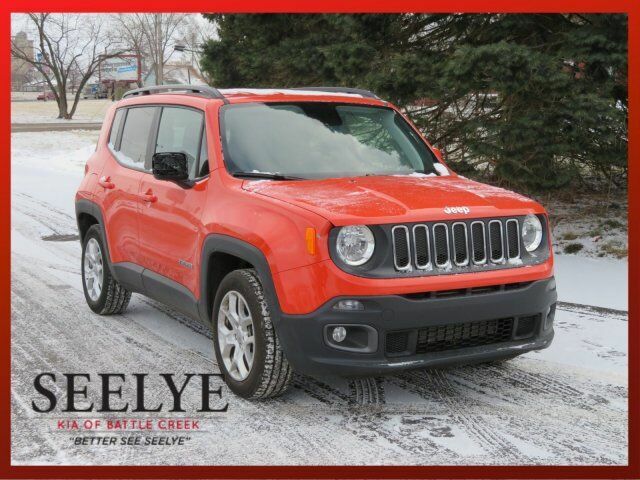 This Jeep Renegade has a dependable Regular Unleaded I-4 2.4 L/144 engine powering this Automatic transmission. Valet Function, Trip Computer, Transmission: 6-Speed C635 Manual, Towing Equipment -inc: Trailer Sway Control, Tires: 215/65R16 LBL AS, Tire Specific Low Tire Pressure Warning, Tailgate/Rear Door Lock Included w/Power Door Locks, Systems Monitor, Strut Front Suspension w/Coil Springs, Streaming Audio, Spare Tire Mobility Kit, Smart Device Integration, Sliding Front Center Armrest, Single Stainless Steel Exhaust, Side Impact Beams, Sentry Key Engine Immobilizer, Seats w/Cloth Back Material, Roof Rack Rails Only, Remote Releases -Inc: Power Fuel, Remote Keyless Entry w/Integrated Key Transmitter, Illuminated Entry and Panic Button.